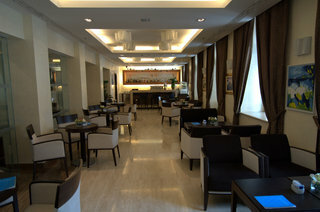 Renovated in 2008, This City Hotel is Built in Traditional Style and is Known For Its Old World Charm. An Elegant Victorian-Style Facade Features At This Piccola Venezia Villa With 2 Accommodation Wings, Linked by an Ornate Courtyard, Swimming Pool and Gardens. The Property Comprises a Total of 163 Guest Rooms and is Air-Conditioned Throughout. It Offers Its Guests a Wide Range of Facilities, Including a Lobby With 24-Hour Reception and Check Out, a Hotel Safe, a Currency Exchange Facility, Lift Access and a Hairdressing Salon. Guests Can Also Make Use of the On-Site Caf??? ?, Bar and Restaurant. Wlan Internet Access and Room and Laundry Services Are All Provided, and There Are Parking Facilities For Those Arriving by Car.